Ahmad Ashkanani looks to repeat his sensational showing this past September - at the 2016 Olympia - as he steps onto the Arnold Classic stage for the first time, next week. 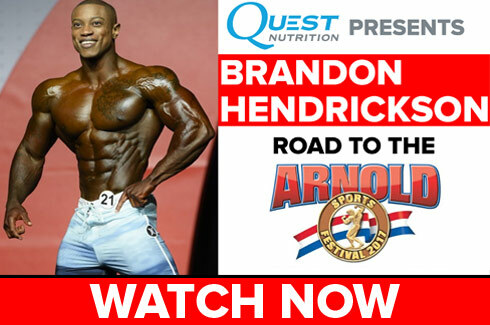 Brandon Hendrickson looks to defend his Arnold Classic Men's Physique crown next week in Columbus, Ohio - but first, he speaks to Dave Palumbo on RXMuscle's Road to the Arnold Classic (powered by Quest Nutrition). Men's Physique rising star Andre Ferguson, who made a splash last season at both the Arnold Classic, looks to make a major statement next week at the 2017 Arnold Classic. Looking for a newcomer who can make a splash at this upcoming Arnold Classic? Look no further than Luke Sandoe. Hidetada Yamagishi joins Dave Palumbo on RXMuscle's Road to the Arnold Classic (powered by Quest Nutrition). 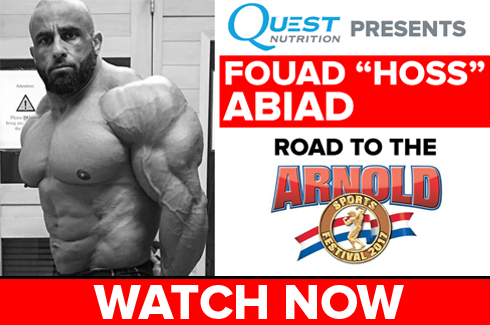 Fouad "Hoss" Abiad joins Dave Palumbo for the latest installment of RXMuscle's Road to the Arnold Classic (powered by Quest Nutrition). Sad news of the passing of Nicole Bassand Josh Lenartowicz, 3rd place finisher at the 2016 Arnold Classic (4th at the Arnold Australia) reveals to RXMuscle.com why he has withdrawn from this year's competition. 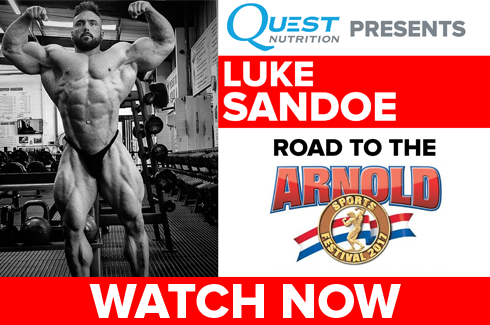 Guy Cisternino aka "Quadro" joins Dave Palumbo for the first installment of RXMuscle's Road to the Arnold Classic (powered by Quest Nutrition). Larissa Reis At The 2016 Arnold Classic Brazil Expo! Eduardo Correa At The 2016 Arnold Classic Brazil Expo! Jay Cutler At The 2016 Arnold Classic Brazil Expo! 2016 Arnold Classic Brazil Preview with Palumbo & Aceto! JOSE RAYMOND - Was this his last Arnold Classic? XCD Nutrition At The 2016 Arnold Australia Expo! SHAWN RHODEN At The 2016 Arnold Australia Expo! Branden Ray At The 2016 Arnold Australia Expo! RICH PIANA At The 2016 Arnold Australia Expo! Jason Poston At The 2016 Arnold Classic Australia! Sadik Hadzovic At The 2016 Arnold Classic Australia! Better Bodies Australia At The 2016 Arnold Australia Expo! 2016 Arnold Classic Australia Open & Fitness Final Wrap Up! OKSANA GRISHINIA Wins At Arnold Classic Australia 2016! JAY CUTLER'S ADVICE for CEDRIC MCMILLAN! LATORYA WATTS after wining Pro FIGURE At 2016 Arnold Classic Australia! INDIA PAULINO after wining Pro Bikini At 2016 Arnold Classic Australia! 2016 Arnold Classic Australia Bikini, Figure Final Wrap Up Plus Men's Open Prejudging! GENN STROBO at the 2016 Arnold Classic Australia! CAMALA RODRIGUEZ at the 2016 Arnold Classic Australia! CEDRIC MCMILLAN out of control at the 2016 Arnold Classic Australia! 2016 Arnold Classic Australia Preview with Shawn Rhoden! RICH PIANA At The 2016 Arnold Classic Expo! BOLERO HYDRATION at 2016 Arnold Classic Expo! RONNIE COLEMAN Interviewed At The 2016 ISHOF! RHODEN UNCENSORED: 'Phil, you better be listening to this"
Kurt Angle Interviewed At The 2016 ISHOF! OKSANA GRISHINIA WINNING ROUTINE At Arnold Classic 2016! Johnny Bench Interviewed At The 2016 ISHOF! CEDRIC MCMILLAN POSING ROUTINE At Arnold Classic 2016! KAI GREENE'S WINNING ROUTINE At Arnold Classic 2016! Arnold Classic Prejudging Photos Now Posted! 2016 Arnold Classic Athlete Meet & Greet! 2016 Arnold Preview With Chris Aceto And Dave Palumbo! Palumbo Joins DigitalMuscle.com Arnold Classic LIVE Webcast! PALUMBO RANT: Judging Posing Rounds At Arnold Classic! Dave Palumbo critiques the 2016 Arnold Classic Lineup! 2015 Montanari Powerhouse Classic Overall Posedown! Evan Centopani Guest Posing At The 2015 Powerhouse Classic! Quest Nutrition At the 2015 Arnold Classic Expo!